Weizmann, Bialik, Einstein and Sinatra passed through halls of Hebrew University at Mount Scopus. So why shouldn’t you pass by yourselves, enjoy wild jungle, mysterious tomb and the most beautiful view in Israel? 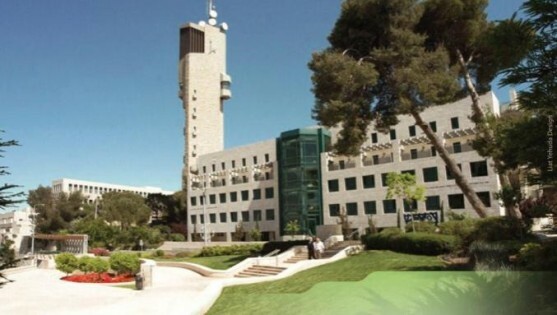 The Hebrew University campus at Mount Scopus isn’t just a place to get an academic degree. 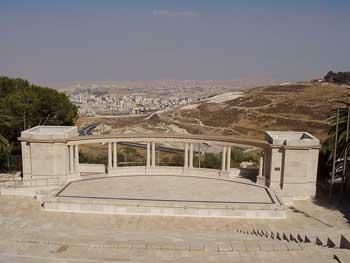 It has a theatre with one of the best views in the county, botanical gardens with a 2000 year old cemetery in the middle, classrooms and even a synagogue with a direct view to the Old City. And, possibly more importantly, it is the highest peak in the area, which gives it its name: Mount Scopus – the mountain of viewers. We will begin our tour at the theatre (and not the amphitheatre, as it is mistakenly called, because it is not 360 degrees). 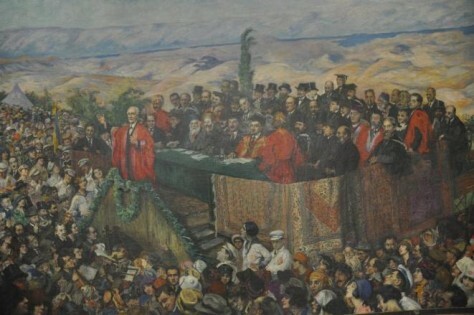 This is where the Hebrew University was inaugurated on April first, 1925, in a grand ceremony including such distinguished guests as the eventual first president Chaim Weizmann, Rabbi Cook, General Allenby, Lord Balfour, The Chief Commissioner Herbert Samuel, Chaim Nachman Bialik who also spoke at the ceremony, and many more. This is the same theatre where Yitzhak Rabin received his honorary doctorate in the name of the IDF after the Six Day War. It is worth mentioning that the head of the board of trustees at that time was Dr. Chaim Weizmann, and that the board included at the time Albert Einstein, Sigmund Freud and Martin Buber. The view visible in the east is the Judea Desert, towards the Dead Sea and Edom mountains in Jordan. Let us not forget that Mount Scopus earned its name by being the highest mountain in the area, standing tall at 829 meters (2,720 feet) above sea level, and 100 meters (328 feet) above the Old City. Looking southward to Mount Olives, the northernmost part of is Mount Scopus, we can see the triangular brown roof of Augusta Victoria. The founding of the university began when the grounds belonging to John Grey Hill were bought before World War I. The groundbreaking was in July, 1918, The cornerstone laid then (14 stones) disappeared from the mountain and was never found again. In February 1923, before the official opening of the university, Prof. Albert Einstein came to Jerusalem. Escorted by Menahem Usishkin, Einstein went to see the designated land and gave the first academic lecture in the area. The topic of the lecture was, surprisingly, the Theory of Relativity. To make sure he was not understood at all, Einstein spoke in French, despite the opening statement being in Hebrew. The beginning of the 1948 war was a major turning point in the history of the place. The division of Jerusalem between the new Israeli state and Jordan left the university and the Hadassah hospital area as an island under Israeli rule, surrounded by Jordanian territory from every direction. The university was forced to leave the area, and its departments spread around in different buildings throughout the city. In 1954 the cornerstone for the Givat Ram campus was laid down, and the Ein Karem Hadassah Hospital was founded around the same time. It is recommended to look up other sources to find out more about the heroics of the defenders of Mount Scopus and the works of “the king of the Mountain”, who was a high-ranking officer. Only in 1981 were the majority of university operations returned to Mount Scopus. Today about 24 thousand students study on campus, and to date it has awarded approximately 100 thousand degrees. It is ranked among the top 100 universities in the world. From the area of the theatre we will go back up the stairs and turn right close to the Institute for Contemporary Judaism. This is where Grey Hill’s mansion once was. On our right we will notice a building with the Pythagoras theorem inscribed in stone on its door. This is one of the first buildings of the university, and once housed the Einstein Mathematical Institute. From this location we can spot the university tower with its massive antenna. The first few floors house university offices and the top floors are used by the military. Anyone looking towards the eastern part of the city will notice three rooftops: the rightmost building with the blue rectangular roof is the Church of the Ascension in Mount Olives; the middle rooftop is the brown triangle of the Augusta Victoria hospital built by the German Kaiser Wilhelm II and named after his wife; the third is the one on Mount Scopus, near where we are currently standing. We will continue to Frank Sinatra plaza where, next to Beit Hillel, we will find another one of the original buildings: the Museum for Judaic Antiquities, now the home of the Institute of Archaeology. The museum’s director was Prof. Sukenik, Yigal Yadin’s father, who was made famous by the discovery of the Dead Sea Scrolls. Near the cafeteria is a living monument: a tree planted in diagonal in a square bed in memory of those killed in the terrible terror attack in 2002. From the tree we will go north near the walkway to the botanical gardens. On our right we will see two more original buildings: the one with the white dome was the national library built in 1929, and the other is the art history building built in the nineteen-forties. The library building once housed the office of the Chancellor of the university, Rabbi Dr. Yehuda Lev Magnes, who used to enjoy the view of the city from his office window, while examining those entering and exiting the university. The building held different ceremonies. The art history building was used for teaching, but in dire situations was also used for student dances. Both buildings have been used by the faculty of law since 1967. It is recommended that from here you walk toward the main building of the university, enjoying lawns, flowers and pretty paths. We will leave the university building and head towards the botanical gardens at the northern part of the campus. On the street between the building and the garden, a little to the east, we can spot a pedestrian bridge, and underneath it, near the street and to the right, a small but impressive ancient burial cave, known as the Monk’s Family Cave. We will enter the botanical gardens from the cement bridge. Welcome to one of the country’s most beautiful jungles, right here in Jerusalem. The garden was founded by Prof. Alexander Aig in 1931. 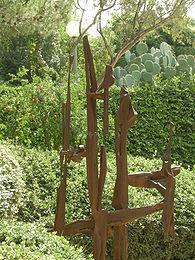 The garden was founded to preserve and display the plant life of Israel, from Lebanon to the desert. 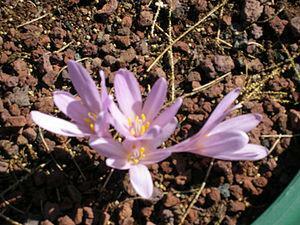 This garden contains one of the largest collections of Israeli uncultivated plants. Wandering around the small garden is impressive, and it is hard to believe that a few meters stand between us and working classrooms. Red arbutus trees, different kinds of irises, various (and sometimes strange) plants, benches, beauty spots and even a waterfall with a pool are all part of the garden. From personal experience, this is the best place for some serious studying before exams. In the past, more collections were a part of the garden. Even the Biblical Zoo started here.Those are now gone from Mount Scopus, but we hope that the garden will not be disappearing soon as well, despite what some plans suggest. There is a small open area in the centre of the garden, which contains one of the best known burial caves in the country, although I assume most students have never heard of it. In this cave the stone coffin (sarcophagus) of Nikanor of Alexandria was found. Nikanor is mentioned in the Talmud as someone who donates many gates to the temple, and a great miracle occurred during their sea voyage. 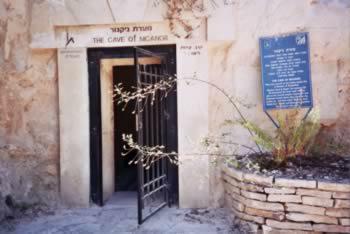 The discovery of this cave in 1902 provided archaeological proof of the existence of a person mentioned in the Talmud during the times of the Second Temple, who also played a part in the construction of the Temple. Two graves of persons more recognizable from contemporary times are situated at the entrance of the open and slightly run down cave: Menahem Usishkin and Yehuda Pinsker. Why are two of the most prominent members of the Zionist movement buried here? Usishkin suggested this location as the burial ground for Pinsker, hoping that a national pantheon would eventually be constructed there. 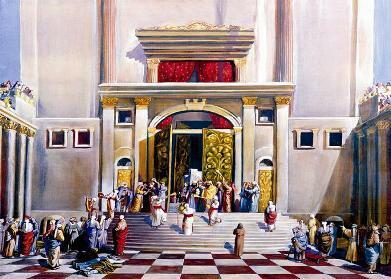 His efforts failed, and the only other Jew to be buried there was himself, as instructed in his will. We will leave the garden from the lower exit, and enter the administration building built after 1967. We will continue to the Forum, and then left, past the library, and to the Hecht Synagogue in block 3 of the humanities building. The uniqueness of the synagogue is the view of the Temple Mount during prayers. Many people mistakenly think that all synagogues everywhere face east. This is true of European synagogues which face east, toward Jerusalem. However, the direction of prayer in Jerusalem synagogues is toward the Temple Mount, where the temple once was. This synagogue faces south, to the Old City and the Temple Mount. 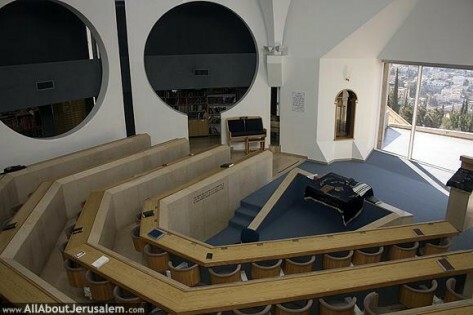 Even those who shy away from visiting synagogues should visit this humble one for its exceptionality and view. The vision of the construction of the university was seen by some as an alternative to the vision of the construction of a third temple, and here we are, standing in the “new” temple overlooking the location of the old one. 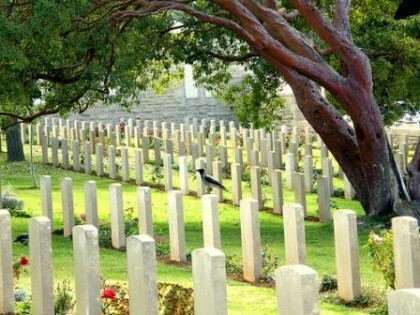 Those who have some time to spare should visit the adjacent British cemetery near the Hadassah Hospital. It is one of the most impressive cemeteries in the country. 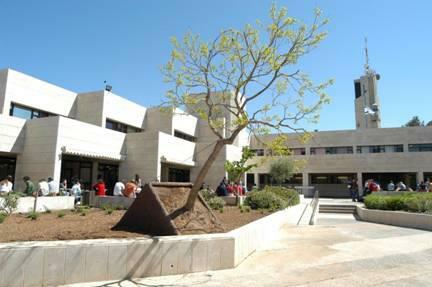 Entrance to the Hebrew University at Mount Scopus is free, with presentation of ID and the approval of the security department near the entrance. Group tours can be set during weekdays.